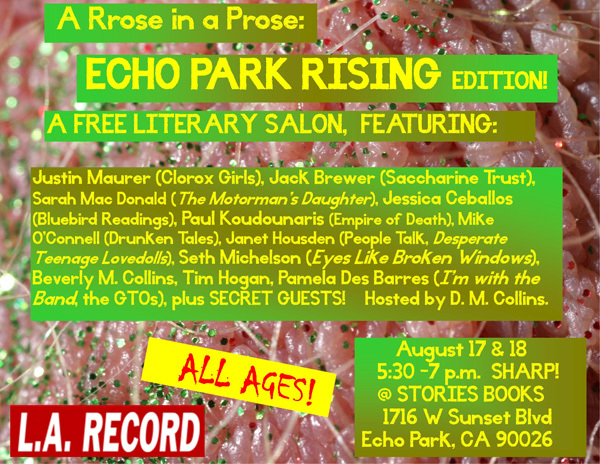 A Rrose in a Prose – this weekend at Echo Park Rising! – A RROSE IN A PROSE REVIVAL! Are you gonna be there/when I make my mark/at the Risin’? Actually it could be described in myriad OTHER ways but you won’t be able to articulate any of them unless you actually attend, now will you? Want more specifics? Here’s the invite for Day 1. And here’s the invite for Day 2.